Ciri plays a card in this stunning 8-inch polyresin bust. Based on The Witcher 3: Wild Hunt. Exquisitely detailed collectible looks like it came right out of the video game! Deal yourself in with The Witcher 3: Wild Hunt Ciri Playing Gwent Bust! In continued collaboration with CD Projekt Red, Dark Horse presents another highly detailed The Witcher bust. Many characters of the Witcher world like to try their hand at Gwent. 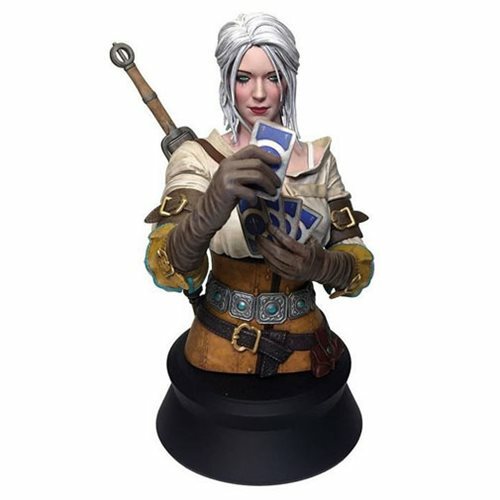 Here, Ciri is depicted playing a card from her hand to the table in a bust that stands 8-inches tall, crafted in scale to the Geralt Playing Gwent Bust (sold separately). This awesome polyresin piece features Ciri with a real card - several of them, in fact - in an exquisitely detailed collectible that looks like it came right out of the video game to enter the reality of your shelf!